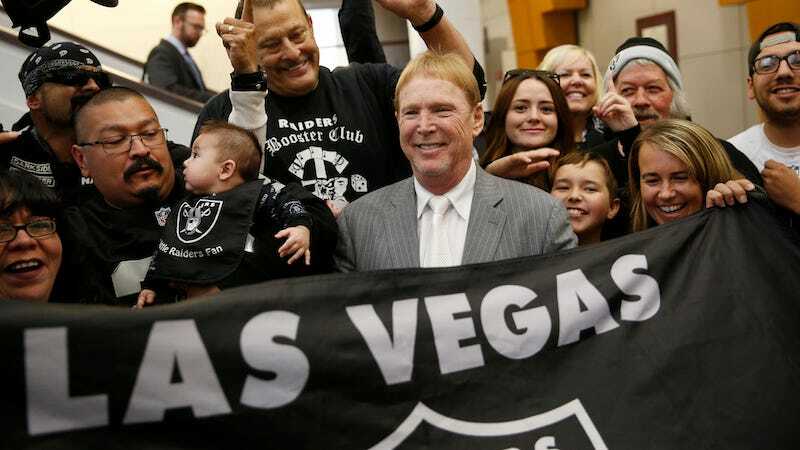 Representatives from Majestic Reality and the Las Vegas Sands casino company, the two groups looking to bring the Oakland Raiders and a brand new NFL stadium to Las Vegas, made their pitch to an oversight committee last night. The proposed stadium would cost $1.9 billion to build, and stadium proponents are asking for a record $750 million in public money to help cover the costs. Actually, they’re demanding it. It’s bad enough when a bunch of suits representing billionaire investors demand any amount of public money for stadium projects, but to demand the biggest public contribution in American history and then say that demand is non-negotiable is some next-level fuckery. The good news is that this particular fight over stadium financing has the potential to be a tipping point of sorts. Rich old baby Mark Davis, truly evil plutocrat Sheldon Adelson, and Las Vegas’s scummy sheen have all combined to create one of the most abhorrent cast of characters we’ve ever seen attached to a stadium financing project. If anyone can finally convince American sports fans and politicians that publicly funded stadiums are a massive scam, it’s these goons.